Good morning from EPHQ everyone! I have an awesome Wedding Tip of the Week for you from my good friends and Partner of Esquire Photography; Shelly at Simply Bridal. This week Simply Bridal has pulled together a list of Hollywood-inspired fitness tips for your best fit body for your wedding day. Check out what Shelly shared for you! This time of year is met with the much anticipated warm weather and the less anticipated bikini season. Plans to get in the best shape ever before the beach or wedding day force us to renew our vows to exercise every day and curse all those delicious treats that tempt us as we gaze at the perfectly chiseled bodies of A-list celebrities with pangs of jealousy. Exercise isn’t the only thing you need to do to have the body of a star, incorporating a healthy lifestyle and choosing foods rich in vitamins and nutrients are necessary in achieving your dream body. 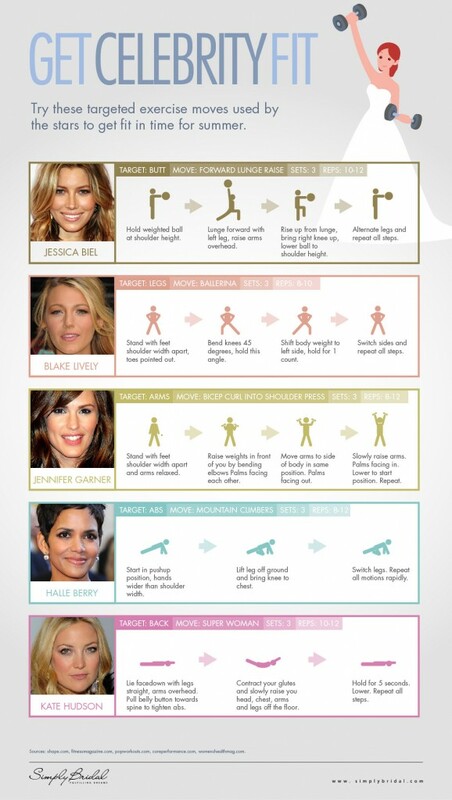 We challenge you to try these celebrity fitness moves for 30 days along with eating a well-balanced diet. Why? It takes 30 days to make a habit and in just 30 days you’re sure to see results that will motivate you to reach your goals. AND more recently – getting hired as the Set Photographer AND as an Actor on the movie; “Skyfell (And I Can’t Get Up)” for The Toscars hosted by Brits in LA and the even more recent announcement I shared: being chosen as a Google #GlassExplorer & photographing the John B Concert all the while kicking off the EPIC Military Discount Program, AND landing two new sponsors that I’m about to share with you soon. If you have any other bits about fitness you’d like to add, be sure to share your thoughts in the comments below or contact me anytime day or night. I’m available just about 24/7 via Twitter, Facebook, Google+, the form on my contact page, or the old fashioned phone as well at 888.ESQ.PHTO (888.377.7486) or 562.225.5915. Thanks again to my friend; Shelly at Simply Bridal for the celebrity fitness tips! That was really awesome of her to do that! PS, Want a nifty print out of today’s Wedding Tip to stick to your fridge? Click this LINK to download.